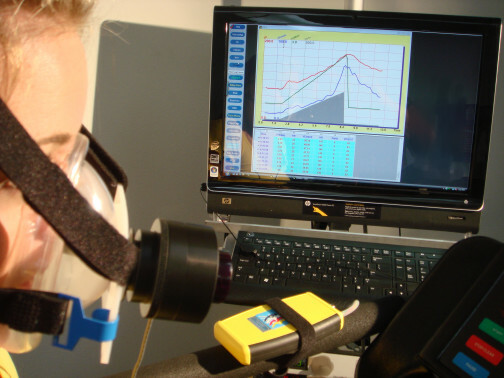 The VT Threshold Detector (The little yellow box in the photo and photo below) quickly and inexpensively determines the ventilatory threshold, which occurs at essentially the same point as the lactate (LT) or anaerobic (AT) threshold. During the test you see a live plot of heart rate (red), estimated VO2 (green), minute ventilation (blue) and watts (workload) (grey filled area). The test procedure is essentially identical to a graded exercise test used for VO2max testing. You connect the data aquisition module to your PC, open our TurboFit software, enter your personal information and start a test with increasing workload. TurboFit-FV software records ventilation and heart rate data, controls certain exercise devices. Tidal volume, breathing rate, Flow-volume loop on demand, continuous strip chart-like display of flow vs. time or volume vs. time, heart rate. Minute volume (Ve), VeSUM, FEV1, Peak flow (PEF), Heart Rate (HR), HR sum, workload in watts, estimated VO2, breath number. External data may be entered post-test and plotted: BP, HR, Lactate, treadmill speed and incline, workload in watts. Operates on PC power supplied via USB connection, no external power supply. All data may be averaged (filtered) breath-by-breath or at timed intervals. Here is a typical plot of ventilation (breathing rate and heart rate against work load. As work load increases, you can see very clearly that at the "VT" point there is a destinct change in the slope of ventilation. This tells you that your "Threshold" occurs at a heart rate of 140 and at a work load of about 153 watts.